Get your first look at the new Peter Jackson movie! They Shall Not Grow Old is a feature documentary made by Peter Jackson and co-directed by Paul Wheatcroft. It's premiering at the London Film Festival next month, and then will open in cinemas in both 2D & 3D. The film features footage from World War I, known as "The Great War", that has been cleaned up, digitized, and colorized to look like it's modern footage from today. "Reaching into the mists of time, Jackson aims to give these men voices, investigate the hopes and fears of the veterans, the humility and humanity that represented a generation changed forever by a global war." Co-commissioned by 14-18 NOW and Imperial War Museums in association with the BBC. The initial premiere in October will include a Q&A with Peter Jackson, hosted by Mark Kermode, that will be broadcast to all the cinemas around the UK. This is just more of an introductory teaser than a real trailer. Take a look. 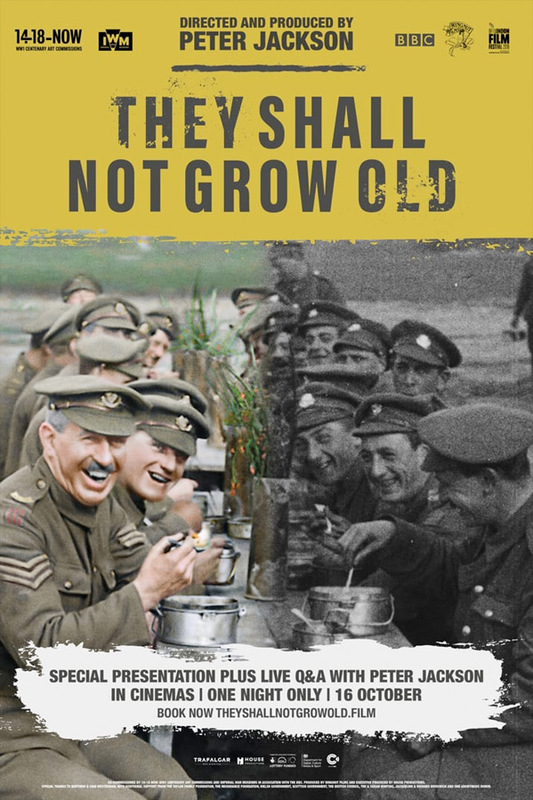 On the centenary of the end of First World War, Peter Jackson presents They Shall Not Grow Old. Using state of the art technology to restore original archival footage which is more than 100-years old, Jackson brings to life the people who can best tell this story: the men who were there. Driven by a personal interest in the First World War, Jackson set out to bring to life the day-to-day experience of its soldiers. After months immersed in the BBC and Imperial War Museums’ archives, narratives and strategies on how to tell this story began to emerge for Jackson. Using the voices of the men involved, the film explores the reality of war on the front line; their attitudes to the conflict; how they ate; slept and formed friendships, as well what their lives were like away from the trenches during their periods of downtime. They Shall Not Grow Old is directed by Kiwi filmmaker Peter Jackson and Paul Wheatcroft. The film will premiere in the UK first for one night on October 16th this fall. For info & tickets, visit the official website. Interested?